The SudoPlus puzzle is a sudoku variant. The rules are the same as the standard version of the puzzle with one additional rule. Place 1 - 9 once in each row, column and 3x3 box. 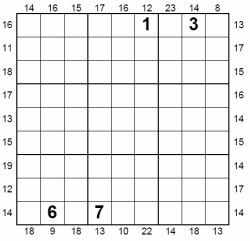 In addition, you will see there are numbers around the grid, at the start and end of each row and column, hence the name outside sudoku for this variant. These numbers tell you what the sum of the three numbers at the start/end of a row/column are accordingly. For instance, a '7' at the start of column 1 tells you that the first three numbers sum to 7, and in that instance they must therefore be 1, 2, and 4 in some order. Here is a link to a free Outside Sudoku Puzzle which will open up in a new window as a PDF. We've also included the solution on the second page for you to reference should you get stuck. Enjoy the puzzle, and if there's any other particular puzzle type you'd like to see, just let us know. Remember you can enjoy lots of interesting puzzle types in PDF format at our puzzle magazines website. Really enjoyed this puzzle, would love to see more in future!